With a sequel in the works, DreamWorks Animation is bringing the $568 million box office hit home. Dun Dun Dahhh! Lauded by critics as “the first great animated film of 2013,” Twentieth Century Fox Home Entertainment has unleashed DreamWorks Animation’s The Croods on Blu-ray 3D, Blu-ray and DVD. The box office smash, which made over $568 million around the globe, introduces the world’s first modern family. Nicolas Cage, Catherine Keener, Ryan Reynolds and Emma Stone are some of the Hollywood names that breathe life into these CGI characters. The Blu-ray and DVD are chock full of fun bonus material that show how DreamWorks dreamed up this colorful world. As a bonus, the Blu-ray and DVD come with a Belt plush toy for a limited time. Written and directed by Chris Sanders (Lilo & Stitch)and Kirk DeMicco(Space Chimps), the story blends humor with a heart warming tale of family bonding and throws in plenty of laughs along the way. 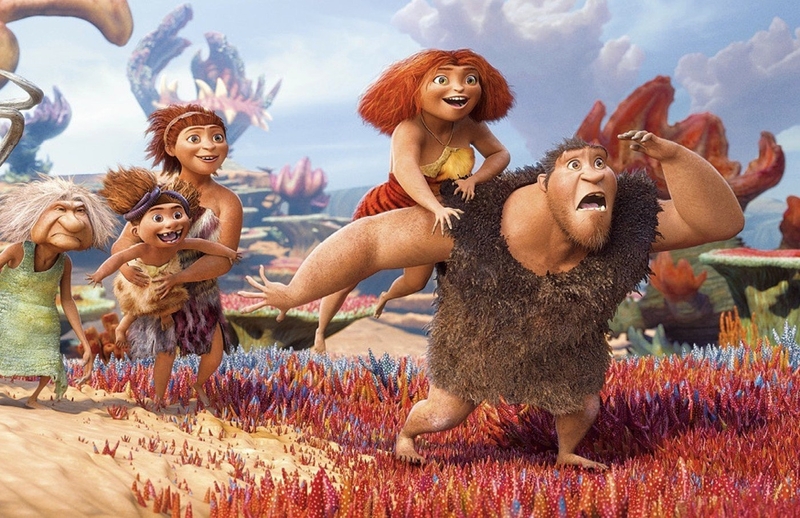 When their cave is destroyed, the Croods set out to explore a spectacular landscape filled with fantastic creatures, strange surprises…and a whole new world of adventure. As they begin to conquer their fear of the outside world, they discover that they have exactly what it takes to survive – each other. The Blu-ray or DVD unlocks additional content on The Croods like the Coloring & Storybook Builder App, which allows children to color their favorite characters and scenes from the film, add text and voice to the story, and then share their storybook on their TVs at home. Be An Artist teaches fans how to draw characters like Belt, Macawnivore and Mousephant from the movie. Families can join Guy, Eep and Belt as they introduce the crazy “Croodaceous Creatures of Croods” – the striking and unique animals from the film. Belt’s Cave Journal follows Belt and Guy as they rescue a Jackrobat. The Croods’ directors share scenes that were deleted from the film in Croods Cuts. Music videos from DreamWorks Animation feature films are showcased in World of DreamWorks Animation.